New Jersey Conservation began working in the City of Camden in 1986, with the long-term vision of establishing a greenway along the Cooper River. More than 30 years later, we’re playing an active role in the city’s renaissance, working with numerous community partners to provide access to nature and waterways, education programs and recreation opportunities. Partnerships are key to Camden’s ongoing transformation into a vital, healthy place where families live, work and play. For over a decade, the William Penn Foundation has been a strong supporter of our work in Camden. We’re a lead partner in the Circuit Trails Coalition, which is creating a network of pedestrian and bicycle trails that will eventually encompass 750 miles in New Jersey and Pennsylvania. 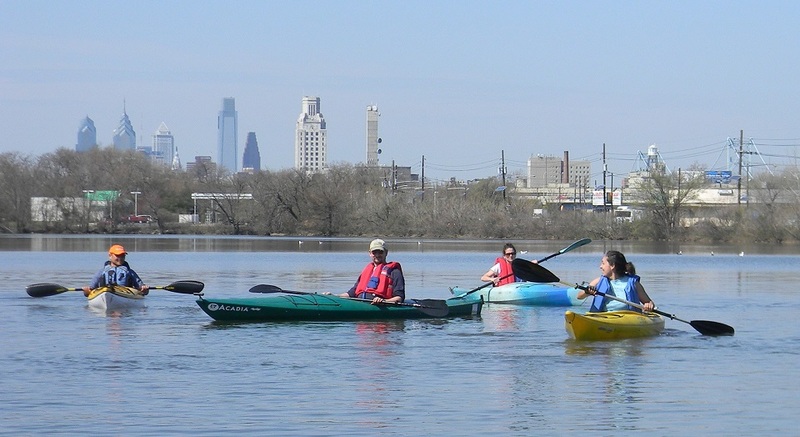 We’re also part of the Alliance for Watershed Education, which organizes programs like kayak trips to help the community become more connected to waterways and protecting water quality. Some other partners include the Camden Collaborative Initiative, Parkside Business & Community in Partnership (PBCIP), Camden Water Equity Task Force, and Discover the Delaware Youth Engagement Program, which provides opportunities for youth to explore the natural areas of Camden. We recently received a New Jersey Health Initiatives grant from the Robert Wood Johnson Foundation to improve health and health equity in Camden. We are utilizing new mapping and planning tools to help our Camden partners ensure that all residents have access to clean air, clean water, safe parks and trails, community gardens and places to enjoy nature. In partnership with the Camden County Municipal Utilities Authority, we’re planning the grand opening of Gateway Park, a 25-acre property with extensive frontage along the Cooper River. It is envisioned as a destination where local residents can exercise, fish, learn about nature, join organized health and recreation programs, and launch kayaks and canoes. To learn more about conservation efforts in Camden, please contact Justin Dennis at justin.dennis@njconservation.org.